OneSole – the interchangeable shoe…. Until I received an email from Quick Change Artist advising me of a 25% off 4th of July sale for Onesole, I’d completely forgotten mine were packed away over the winter. I immediately pulled out the box with my Traveler sole and the comfort tops I’d ordered in the fall and put them on. For any woman who loves footwear, Onesole is a delightful invention that was featured on Shark Tank – a show I’ve only seen once. But, the episode I did see included a pitch by Onesole seeking for funding from the investors. 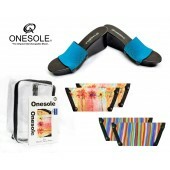 The idea was brilliant… buy one sole with multiple interchangeable tops. And, the sole was reportedly comfortable. While I’ve never ordered anything from an ad on TV, I immediately ordered the Shark Tank Special….a Travelers sole and 3 extra tops. My original purchase, a café Travelers sole, was disappointing because the color eroded from the PVC sole with one wearing. I was livid and contacted customer service immediately. After a couple of emails, Quick Change Artist sent me a replacement with the black sole. The stood by their product and made me a happy customer. That shoe has been fabulous. I subsequently ordered more tops. There company sells several different sole profiles including a comfort flat, an all purpose Traveler, a Diva heel, a kitten heel and a classic profile. I initially purchased the Traveler and recently ordered the classic, which is more casual. These shoes are ideal for travel because one can wear one sole, pack another, and then pack multiple tops. And, as advertised, they are comfortable. The tops have various style including the basic stretchy comfort slide, a dressier leather belt slide, an espadrille, a T-strap and even a clog style. Amazingly, all of the tops are attached by 4 snaps – two on each side of the sole. The comfort tops are hand washable! And, many of the tops are colorful with unique artistic designs that make your footwear wardrobe special. The inventor, Dominique Barteet, is a pharmacist who designed the shoe as a hobby. Now, her pharmacy is the hobby. As an avowed shoe addict, I cannot say that Onesole will keep me from purchasing other shoes in multiples. But, I can state that Onesole is a brilliant invention that offers a product that is comfortable, affordable, and provides an opportunity to expand ones shoe wardrobe without spending a fortune. There is no better option for travel.